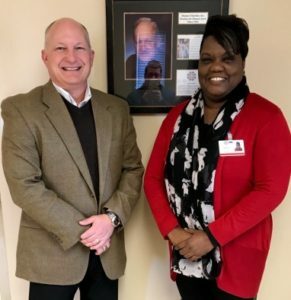 Jim Erwin, Interim Commissioner of the Kentucky Department of Corrections, visited the Dismas program in early January for a tour and remarked to Director T.C. Cox (right) that he was impressed with its cleanliness and organization. Erwin visited both Owensboro buildings with Cox explaining the different populations and services provided. This was his first visit to a Dismas facility.